All Contacts in your organization that exist on the Nextiva system come pre-loaded into the Directory when first logging into the Nextiva App. 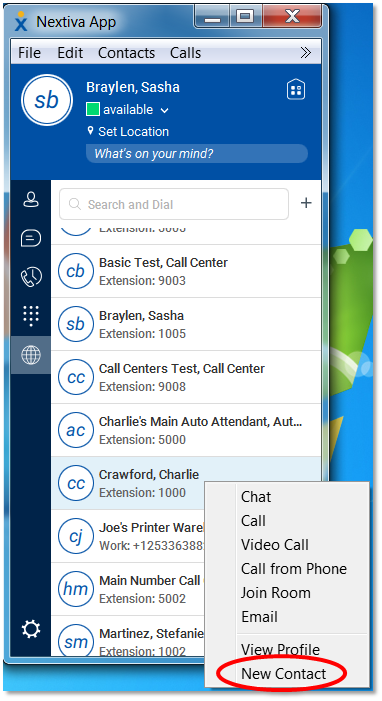 The Directory contains all of the Auto Attendants, Call Centers, Call Groups, and Users that are on the Nextiva system. Adding a Contact to Contacts is one of the ways you can chat with other Nextiva App users in the organization, and easily communicate with them without having to scroll through the entire list of Directory Contacts. Think of Contacts as your own Nextiva App phonebook. The easiest way to add a Contact if the desired Contact is part of your organization is through the Directory. Adding Contacts from the Directory makes it quicker to find Contacts in your organization that you communicate with often, without scrolling through entire company list every time. With the Directory section selected on the left toolbar, right click the name of the contact you would like to add and select New Contact (Figure 1-1). It is also possible to search for the contact in the Search and Dial search bar at the top of the Nextiva App. Once completed, the Contact will receive a message requesting permission to display their Team Presence. The Contact will need to select Accept to allow permission to view (Figure 1-2). Once the permissions are accepted, it will be possible to see the new Contact’s Team Presence in the Contacts section on the left toolbar. 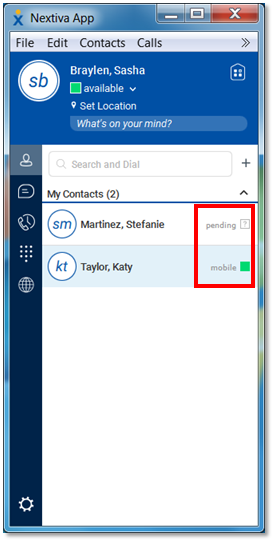 If there is a question mark to the right of the Contact with the word pending, the permissions have not been accepted (Figure 1-3). 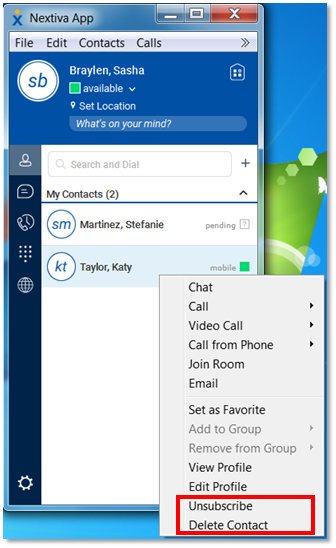 While still possible to chat, voice, and video call, Team Presence will not be shown until the User grants permission. Manually inputting Contacts is required if the Contact being added is not in your organizational Directory. 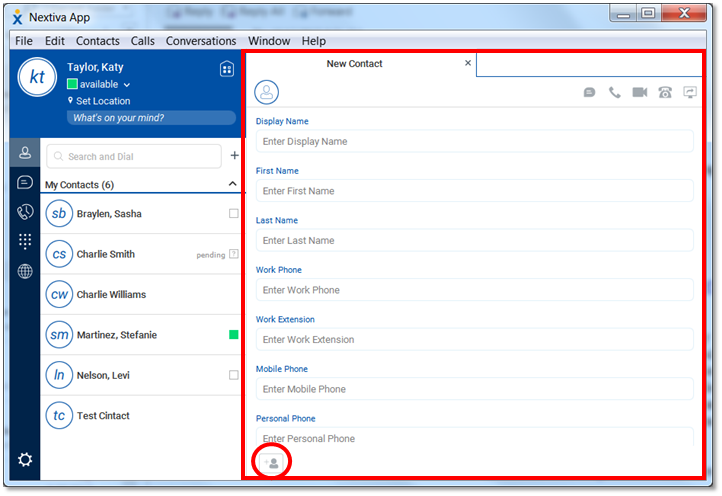 While in the Contacts section, select the plus sign in the upper right corner, then select New Contact (Figure 2-1). Fill out the information in the corresponding fields, then select the Add to Contact List icon (Figure: 2-2). 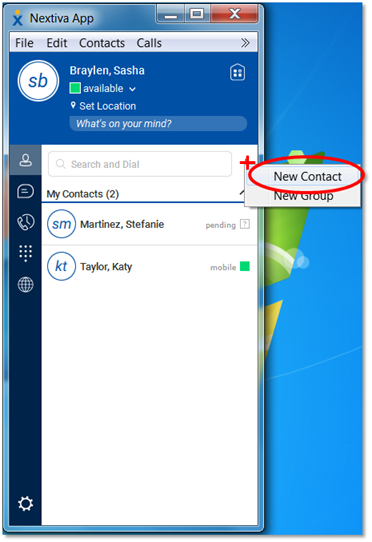 Once the Contact is saved, the Contact will be located in the Contacts section for easy access. If you selected the option to install the Outlook plug-in during the installation of the Nextiva App, then you can search the Outlook address book from the Nextiva App and add those Contacts. For information about Outlook integration, see Nextiva App: Outlook Integration. Delete Contact: Deletes the Contact completely from the local profile. The Contact will still be located in your Directory if they are part of your organization.